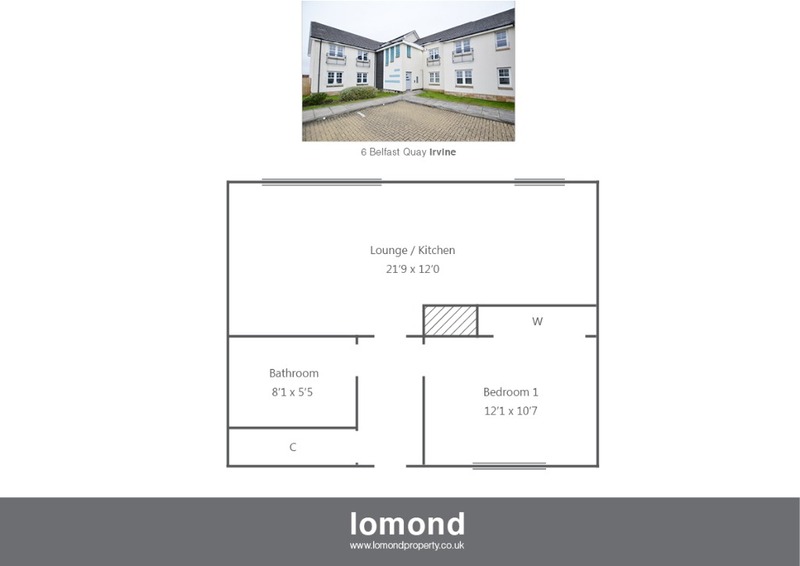 Situated in the established Moorings development just a short walk from the train station and popular harbour area of Irvine. The apartment is situated on the first floor within a factored block comprising, large open plan lounge/kitchen, double bedroom, and family bathroom. Externally the property comes with allocated parking, and secure door entry. In summary the property layout extends to a secure door entry with stairs to the first floor. The apartment itself comprises of a welcoming hallway with a large walk in cupboard. The main living space is an open plan lounge/kitchen that stretches the entire width of the property. The kitchen is well stocked with floor and wall mounted units, integrated fridge, freezer, washing machine, dishwasher and gas hob, oven and hood. A breakfast bar completes the kitchen area. The bedroom is double in size with fitted wardrobes. The family bathroom is well presented with bath, over shower, WC and WHB, all finished to stylish modern tiling. Externally the property is located on factored grounds. There is an allocated parking space with optional visitors parking. The property benefits further from gas central heating, and double glazing throughout.